Owners of commercial vessels bristle at the prospect of losing berthing space to yachts. PORTLAND – Fishermen are notoriously hard to organize because they don’t stay in one place for long. So Willis Spear of Yarmouth took Monday off and motored his 35-foot lobster boat around Casco Bay, meeting up with lobstermen as they worked their trap lines. 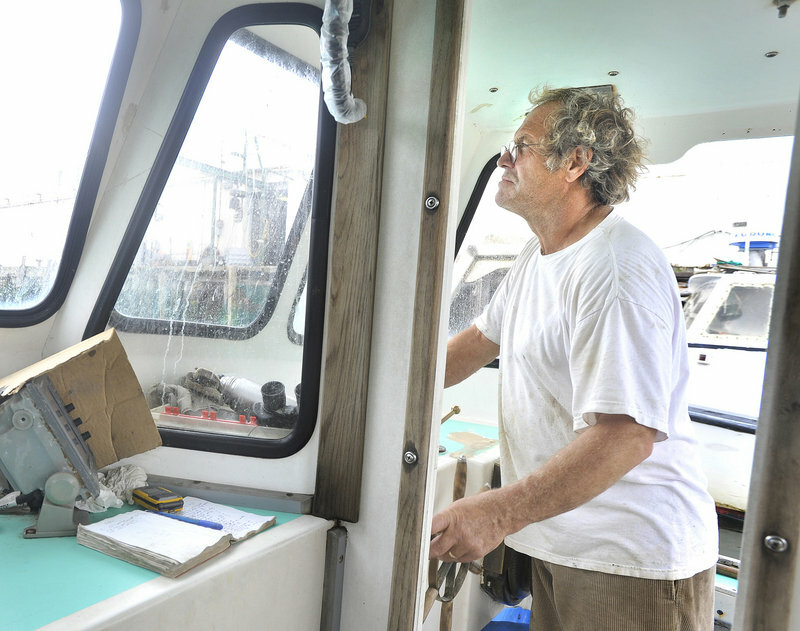 Tom Wood, 24, serves as sternman on Yarmouth fisherman Willis Spear’s lobster boat. “Rich people just have more money and get whatever they want,” Wood said Tuesday. Spear spread the word on his VHF radio, and soon boats were coming to him. Spear started at 7 a.m. By lunchtime, he had the signatures of 70 lobstermen, their vessels’ names and their berthing locations. Later Monday, he delivered the petition to the City Council. The council plans to debate next month whether to approve a package of zoning changes advocated by pier owners to allow more nonmarine development and more pleasure boats in Portland’s central waterfront zone, the cluster of wharves and piers between the Maine State Pier and the International Marine Terminal. The increase in pleasure boats would be modest. Under current rules, each pier can allocate as much as 50 feet of berthing space to noncommercial vessels. The pier owners propose allowing as much as 100 feet. Spear, 58, a lifelong fisherman from Cousins Island, said fishermen don’t like the proposal overall. But the petition is focused on what Spear considers the most threatening part: the provision to allow pleasure boats more berthing space. That change would likely drive up the cost of berthing space and make it harder for fishermen to find affordable places to store their traps and tie up at night, he said. 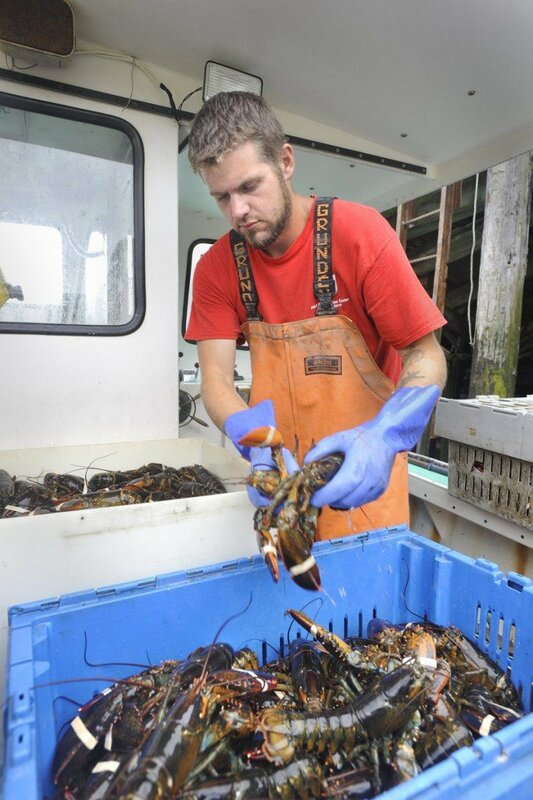 His sternman, Tom Wood, 24, of Portland, said pleasure boaters would simply outbid lobstermen for berthing space. Richard Ingalls, who has represented the pier owners at city meetings, said the pier owners are looking for ways to increase their income so they can maintain the piers and wharves that fishermen need. Because of federal rules that have made it prohibitively expensive to dredge polluted silt, many of the berthing areas close to Commercial Street are now so shallow that only pleasure boats can berth there, he said. He said the pier owners need more flexibility so they can maintain the expensive piers, and fishermen will benefit from that additional maintenance. In a report on the central waterfront zone, the city’s planning staff said the commercial berthing supply defines Portland Harbor as a fishing port and a working waterfront. Using aerial photos, the staff estimated that there is about 16,000 linear feet of commercial berthing in the zone. In addition, there are at least 175 slips for pleasure boats at Chandler’s Wharf and Long Wharf. Altogether, there are nearly 400 vessels berthed in the zone. That includes 175 commercial vessels, most of which are lobster boats. In October, the pier owners reported that about 700 feet of berthing space was vacant. Because of supply and demand, pleasure boat owners generally pay $70 per linear foot for berthing, while the cost is $10 a foot for commercial boats, Spear said. His son Marshall Spear, 26, of Portland, who also owns a lobster boat, said he doesn’t believe the pier owners’ argument that pleasure boats are better suited for the shallow water than fishing boats.